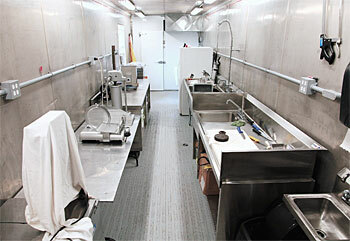 We manufacture customized mobile slaughter and meat-shop facilities in modular construction. You can use them for the processing of pigs, goats, sheeps and poultry. The slaughter- and meat shop facility is built in modules, you can add as many modules as neccerary for your demand. All modules are well foam insulated and lined with stainless steel, floors are tiled. Each modul is about 39 feet by 9 feet by 9 feet high. We are able to deliver every modul complete with door, window, power panel, lights, electric, walk in cooler, hand wash - and normal sinks, water heater, UV light, and grease trap incl. all drainpipes. The modules are resting on 2 foundations and you can place them with a crane at your location. The price for one equipped modul ranges between $78.000 - $148.000, the price depends on your configuration. Please request for a quote.